Students from across Canada convened in Vancouver this past weekend to compete in the 2018 National Public Administration Case Competition (NAPCC). Students from across Canada convened in Vancouver this past weekend to compete in the 2018 National Public Administration Case Competition (NAPCC). 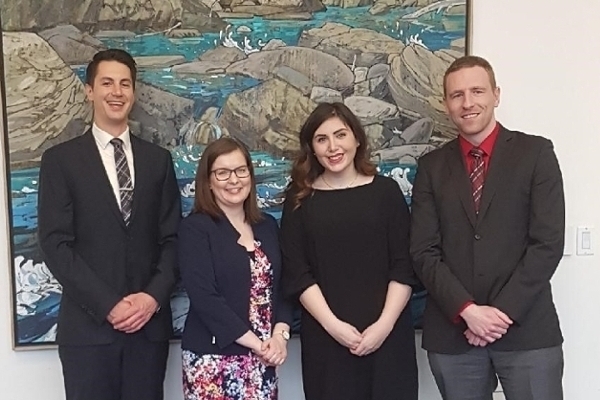 Hosted by Simon Fraser University, in collaboration with the Canadian Association of Programs in Public Administration (CAPPA) and the Institute of Public Administration of Canada (IPAC), the competition saw involvement from 13 institutions. Designed to highlight the excellence of Canadian public administration programs and students, the competition provides a valuable learning experience for students. Representing the Johnson Shoyama Graduate School were Libbey Morin, Lori Wareham, Michael Horvath and Jared Dunitz. Over the course of the past week, the JSGS team was busy reviewing, analyzing and debating policy options related to a slightly fictionalized pipeline project in British Columbia. As part of their presentations delivered on Saturday, the students were asked to brief the provincial Minister of Forests, Lands, Natural Resource Operations and Rural Development for his upcoming meeting with the opposition and to provide the Government of British Columbia with policy and implementation options regarding its pipeline policy. Highly applicable to the current environment in BC, this case was very complex and offered the students much to think about and consider. Ultimately, the JSGS team concluded on three possible recommendation: (1) status quo, (2) conditionally support the pipeline, or (3) oppose the pipeline. The JSGS team strategically chose to conditionally support the pipeline in hopes of supporting the best outcome for the residents of British Columbia. They then presented to a panel of five judges composed of high-level provincial and federal government officials. Their hard work and dedication paid off, with the team placing third behind Simon Fraser University and Carleton University. Impressed by this group of students, coach and JSGS Senior Policy Fellow Dale Eisler, commending them on their strong work ethic and their ability to overcome the challenge of working between classes, jobs, and across both Saskatoon and Regina campuses. "The students showed exceptional dedication in preparing for the competition while dealing with a truly complex policy issue,” said Eisler, “They did us proud." Tianna Yaskow, JSGS Student Experience Officer recognizes the effort that this competition required and that this opportunity is akin to what students may experience in their future employment. She also applauds them on a job well done. On behalf of her team, Lori expresses their excitement towards winning and offers gratitude to all those that guided them in preparation and delivery of this case. The 13 universities that competed in the competition included the University of British Columbia, Carleton University, Concordia University, Dalhousie University, Glendon College, Johnson Shoyama Graduate School of Public Policy, Laval University, University of Ottawa, Queen’s University, Ryerson University, Simon Fraser University, University of Toronto, and York University. For more information on the National Public Administration Case Competition, visit https://cappa.ca/what-we-do/case-competition/.